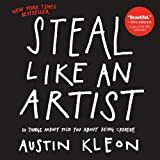 So I’m sure we’ve all at least heard of the book, ‘Steal Like an Artist’ by Austin Kleon. Well there’s probably not a week that goes by without me reading parts of it again, and this week I wanted to share this excerpt just because, as a writer, I know this will resonate. ‘One thing I’ve learned in my brief career: It’s the side projects that really take off. By side projects I mean the stuff that you thought was just messing around. Stuff that’s just play. That’s actually the good stuff. That’s when the magic happens. So today, instead of working on the book I’m so desperate to finish, I may just read something from my ‘to read’ list, or finish the art work I’ve left in a folder for so long, believing it to be not as important as working on my novel.